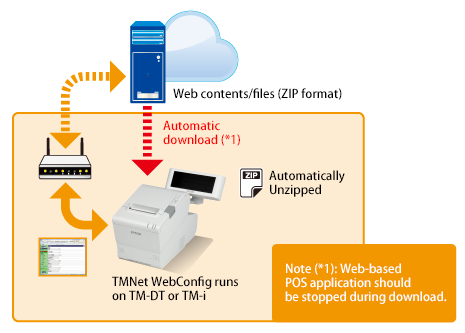 Web Contents Update is the function to update contents at TM-Intelligent printer on schedule automatically. The contents to be updated is placed at the certain Web server on the Internet. The ZIP file is automatically un-zipped, then contents in the certain folder on the TM-Intelligent printer are updated. This function eases support and maintenance work at a shop.